Dear all, it’s time for a break from the blog. I understand that even as a free blog there is a kind of duty to the visitors so I apologise for any disappointment. I am very appreciative of the regular readers and contributors. I need a break from punching out my postings and administrating the site and will be back in the future. Until then you know my views and as most of my stuff is medium to long term those views are unlikely to change, barring any radical developments. All the material on the site will stay where it is. 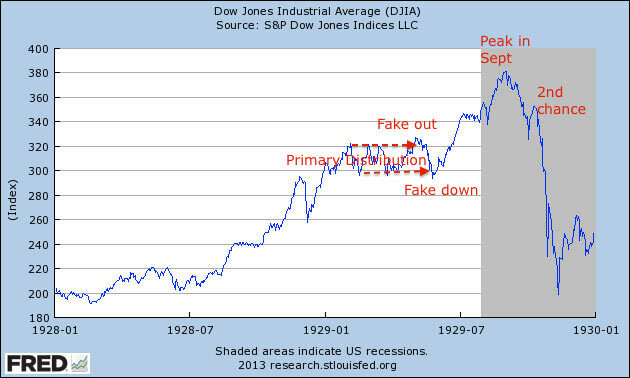 Evidence reveals the financial markets to be ‘dumb’. Long term trends are dictated by demographics (swelling numbers of buyers or sellers) and solar cycles (influencing speculation levels amongst participants). Markets top out when there are no new buyers left and/or no room or appetite for existing buyers to increase debt, and bottom at the opposite. This contrasts with common wisdom that markets are instead dictated by central bank actions, economic indicators, or company fundamentals. They play a role, but the evidence shows that the stock market leads the economy, that central banks are typically behind the curve, and that stocks rise purely on multiple (valuation) expansion if there is either swelling leverage or swelling buyers (or fall vice versa). 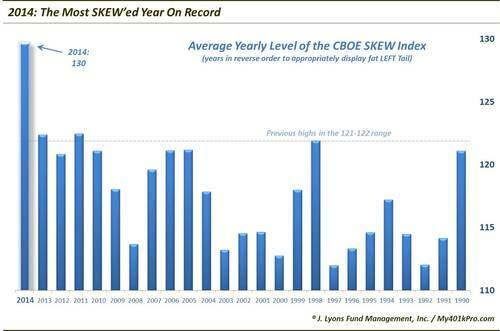 Into 2014’s solar maximum we saw a speculative mania in equities akin to the last solar maximum of 2000. 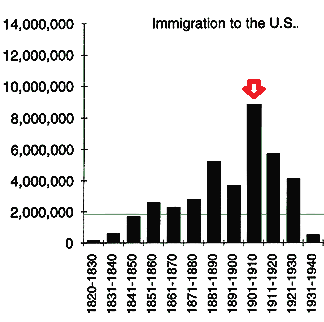 But unlike 2000, there was no demographic tailwind, instead a headwind. Without new buyer flows into the market, we have therefore seen equities bid up by (1) existing buyers leveraging up and (2) companies buying back their own shares. This chart captures the flat money flows as predicted by demographics versus the declining share issuance due to buybacks. The effect of buybacks is to increase EPS and decrease P/E. The latest earnings show a blended 1% decline YOY, but without those buybacks the figure would have been closer to -4%. Revenues declined 3.3% YOY and reveal a truer picture of companies performance. Additionally, companies have largely borrowed to buy back their shares, making this market fuel particularly ‘unhealthy’. 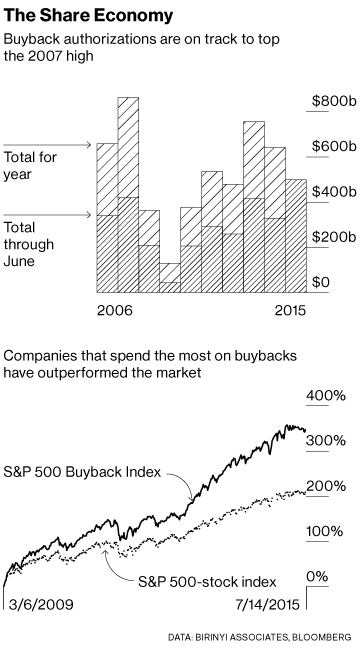 Buybacks are likely heading for a new record this year, beating the 2007 record. 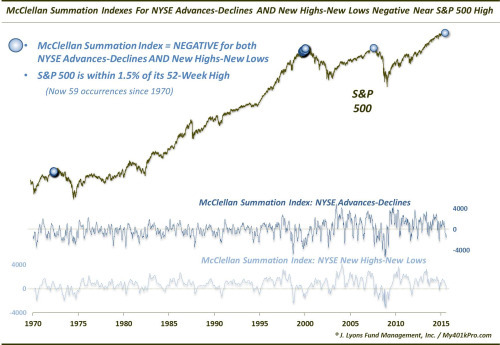 This may partially account for stocks continuing to levitate despite all-round deterioration in other indicators. Whilst margin debt lurched upwards again in 2015 to a current April high. 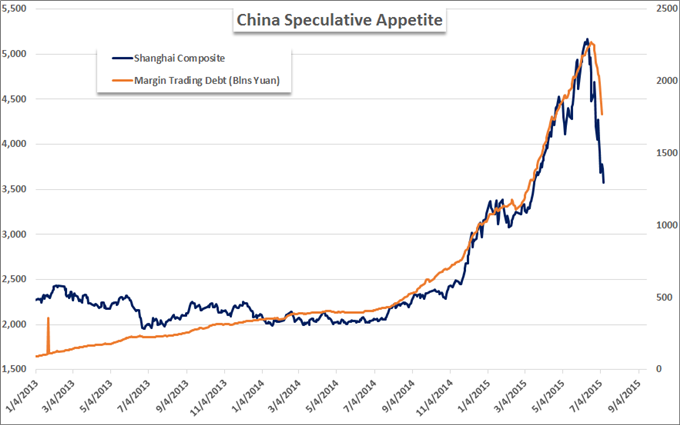 Meanwhile in China margin debt went crazy and can be seen to be wholly accountable for the rise in the Shanghai Composite. This too fits with demographics there: no new buyers, only existing buyers leveraging. 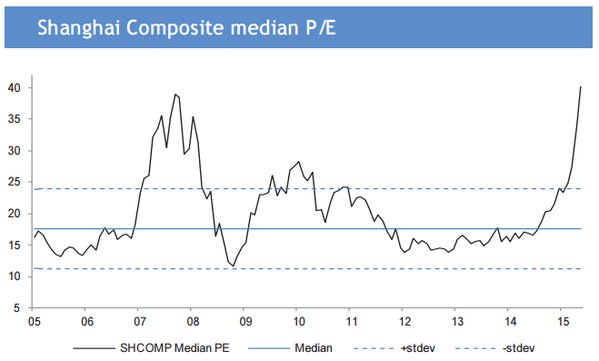 The subsequent collapse in China’s stock market shows what happens when there is no room or appetite for further leverage amongst participants, which brings us back to the top of this post. Then, when leverage starts to unwind, it brings about forced redemptions and thus more selling, as it is effectively a ponzi scheme. 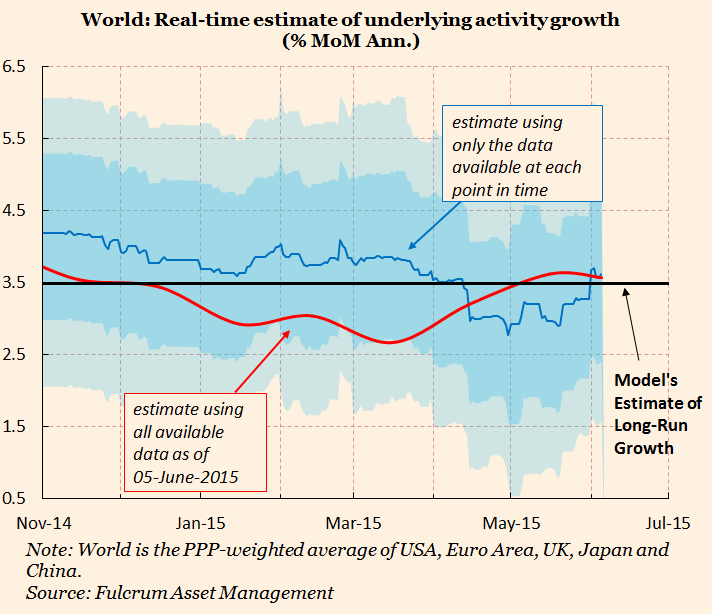 So the question is when leverage in the US and elsewhere starts to unwind. Based on historical evidence, appetite for leverage should wane post solar maximum. We see that in leveraged loans above, but margin debt has rallied further. We know from 1929 that leverage extended a year post solar maximum before collapsing, whilst breadth deteriorated over the same 12+ months. We are again producing that kind of outlier extension, set against a similar ongoing breadth deterioration since the solar max of last year. Either the sideways range in US stocks in 2015 is the pause that refreshes the bull or it is the topping process that turns into the leverage reversal inspired sharp declines. Solar-aside, there have been so many indicators that this is a market top, sharing characteristics with 2007, 2000 and other major historic peaks, that a bull pause is highly unlikely. But what’s different is that the interest rate, QE and inflation environment, together with commodities relative performance, hasn’t been seen in 50+ years, if this is to mark a top. However, rather than that negating a top, we simply need to look further back in time for reference points. Yet, if the stock market is a dumb mechanism, then we shouldn’t even need to do that. The solar max produced the stock market mania. Demographic trends meant it has been fuelled by leverage and buybacks. The flat market of 2015 suggests saturation has been reached. Post-solar max, appetite for speculation unwittingly declines. 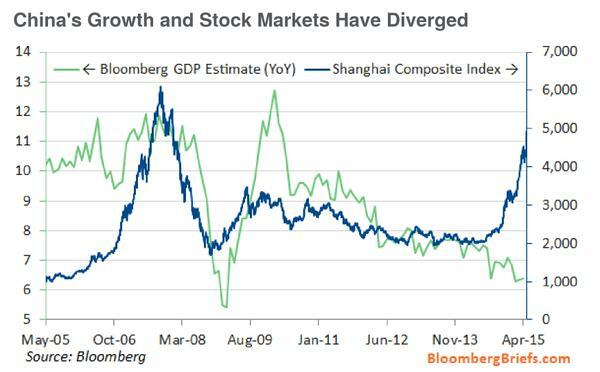 China has broken and all markets are off their peaks. 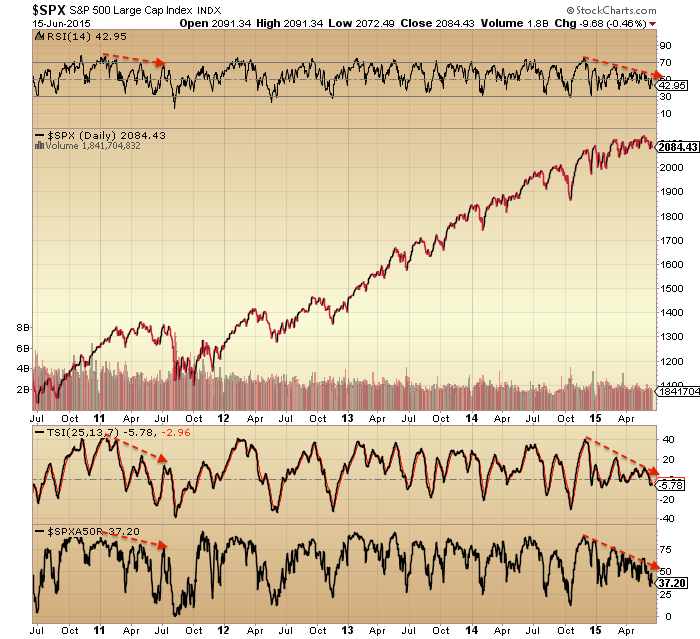 The last several weeks, indicators that have worked for the bulls over the last 2 years haven’t been working. I think the fuel is spent. Buybacks and margin debt are the key here, but both data sets come out with a lag. 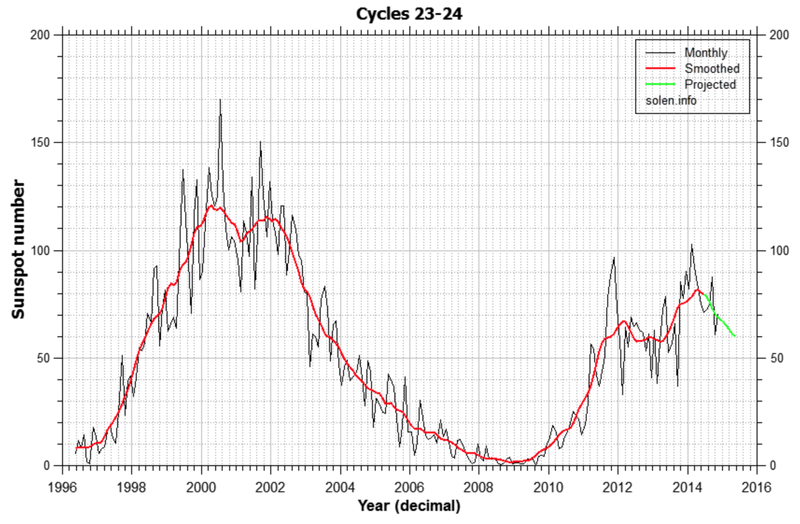 Below we see several key indicators peaked out with last year’s solar max whilst a couple of others extended beyond. Now the latter should fall in line with the former. Note how the levels reached have been largely similar to 2000’s saturation levels. We are now through the August new moon, heading into the seasonal (geomagnetic) lows of Sept/Oct. I’ve been back on the attack short stocks, with particular emphasis on Biotech. The Dow and SP500 are combined flat for the year and the 7 month price range has resulted in bollinger bands that are the closest in 20 years. Behind the scenes we see evidence of a major peak in equities, making the range a likely topping process. Yet we are also seeing signs of a significant bottom. These bottoming signals have formed less than 5% from the highs. So are they a springboard for a break upwards out of the price range before stocks top out? It’s one possibility. 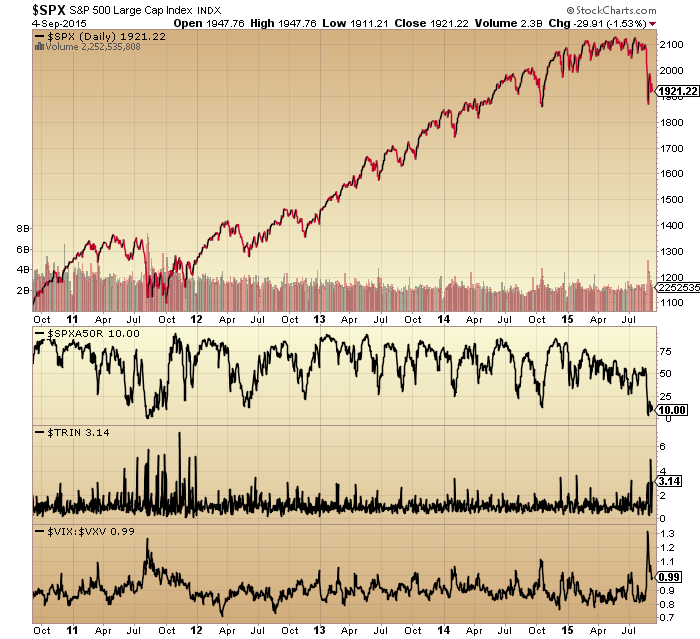 Note that previous incidences of the topping indicators gave rise to at least a 15% sell off, whether it be more like 2011, 2010, 2007 or 2000 in nature. 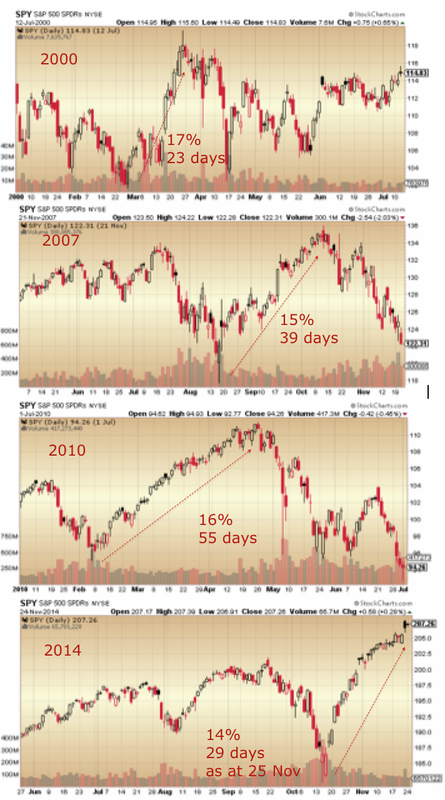 Meanwhile, the bottoming indicators often formed at bear market pauses, at selling exhaustion points. Has a bear market begun then? It’s another possibility, but the shallowness so far of the selling is odd. What’s also confusing is that some indicators have washed out at this point whereas others remain at contrarian levels, such as Vix. Plus note that some indicators have produced a clustering of extremes for 12 months now, stuck at levels from which mean reversion would have historically fairly swiftly occurred. All told, it’s more history in the making and makes it difficult to call the outcome with high confidence. 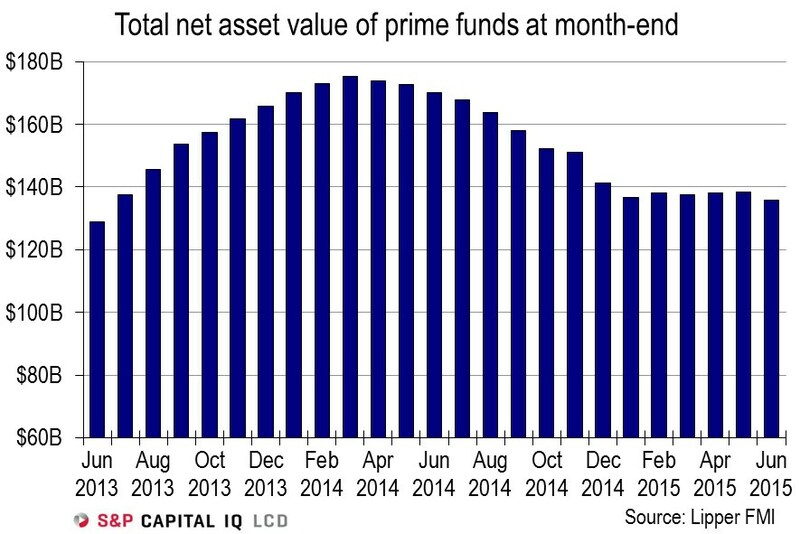 Buybacks peaked out in Q1 2014, IPOs in Q3 2014. 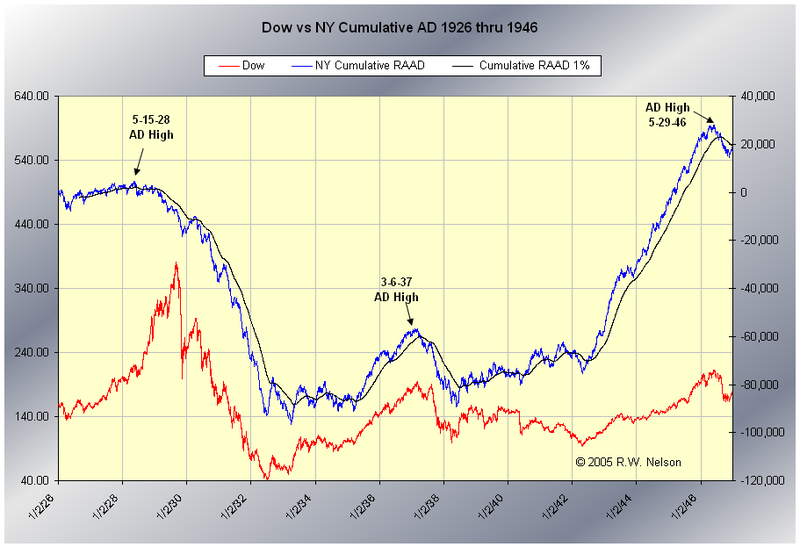 Data shows that money flows into equities have been flat in this cyclical bull, in line with demographic predictions. 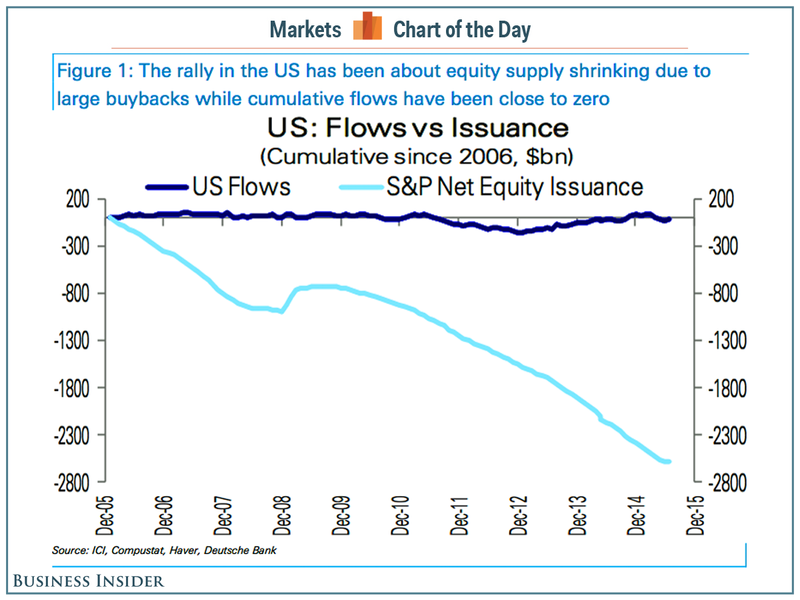 Without new buying sources, the bull has been fuelled by buybacks and existing participants leveraging up. 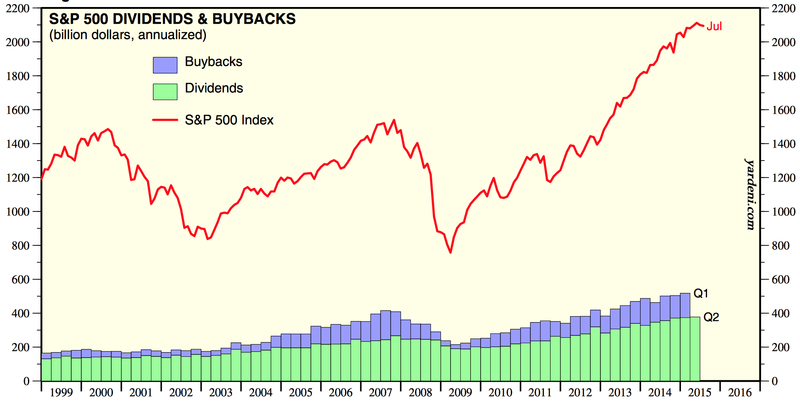 With buybacks decreasing, the bull (if still in progress) is reliant on continued increases in leverage. 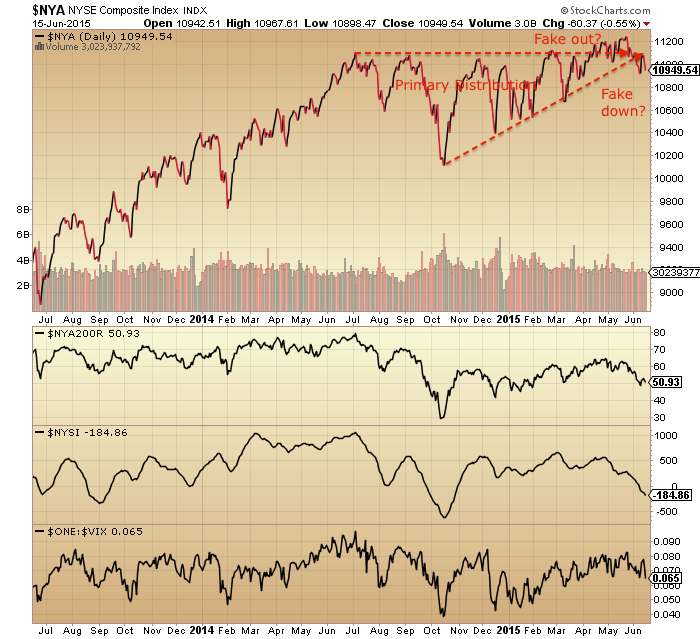 As things stand right now, stocks may need to move higher to neutralise those bottoming indicators. Therefore I can’t rule out the possibility of a final move higher, an overthrow, before a true rollover. However, stocks are also overdue a deep and sharp correction and the clustering of indicators, both top and bottom, within such a tight price range, could also produce a swift move lower, before a partial retrace upwards. 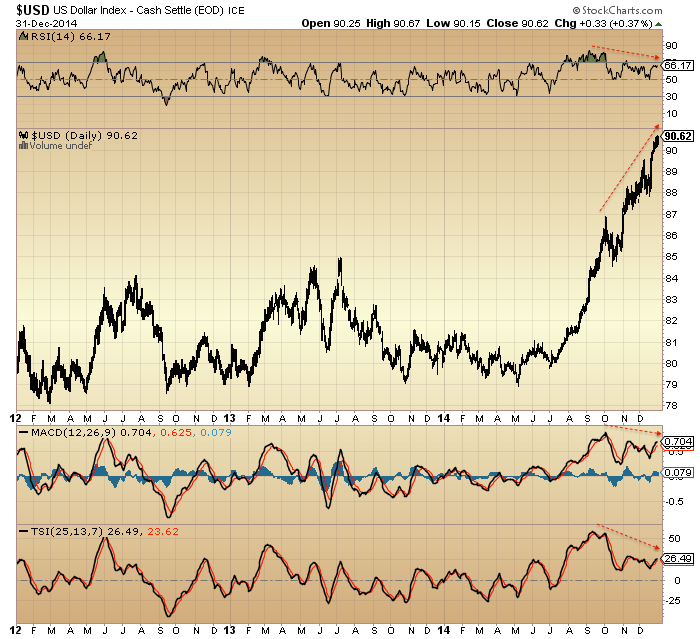 It may be that fuel has been exhausted and certain indicators are therefore not as contrarian as they may be perceived. In short, right now I’m watching and waiting to see which we way we break before attacking again. 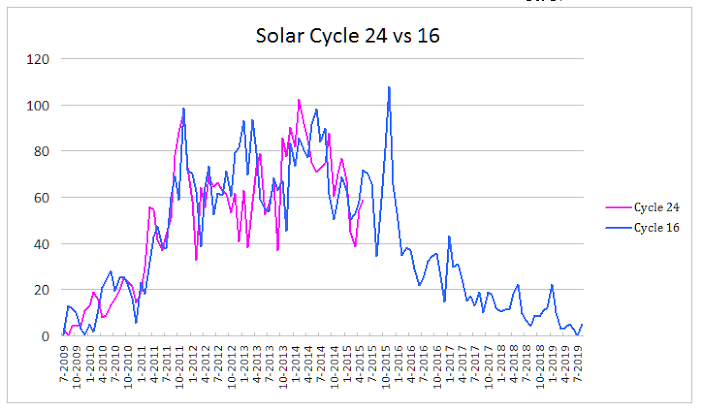 The triple confluence peak of peak speculation: the new moon closest to the seasonal geomagnetic peak closest to the smoothed solar maximum: 27th June 2014. 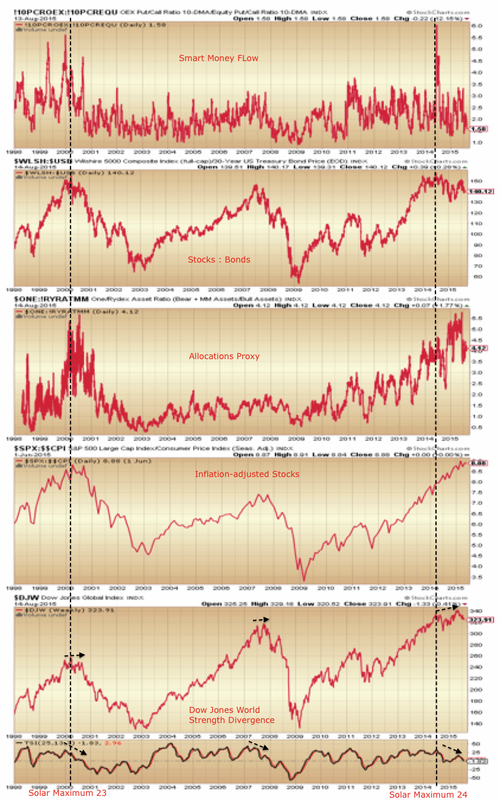 Many assets and indicators peaked then. Breadth bar cumulative advance declines peaked then too, with the latter having recently turned down. 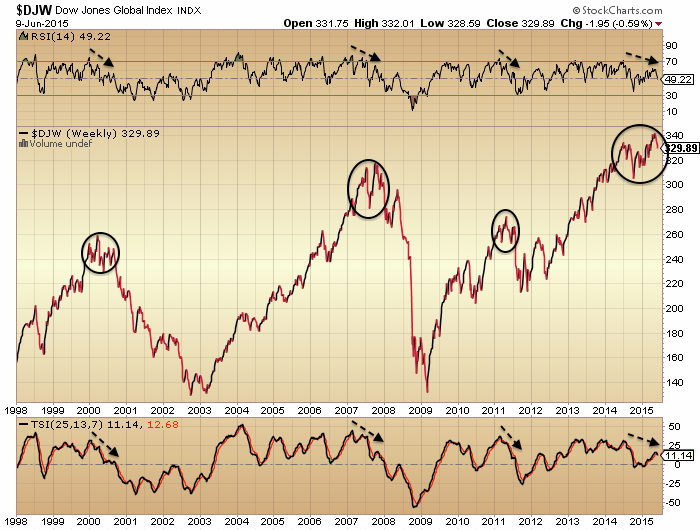 The global stock index has made a marginal new high since that point but the divergences in strength closely resemble previous major peaks. 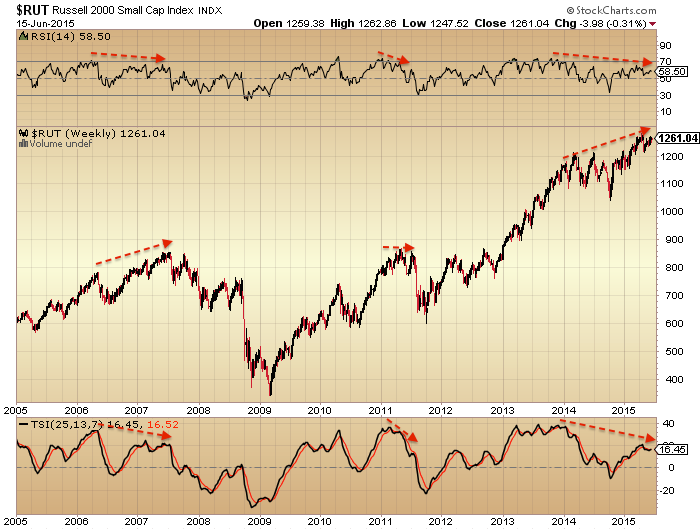 The SP500 also shows a strength (and breadth) divergence that mirrors the 2011 major peak. 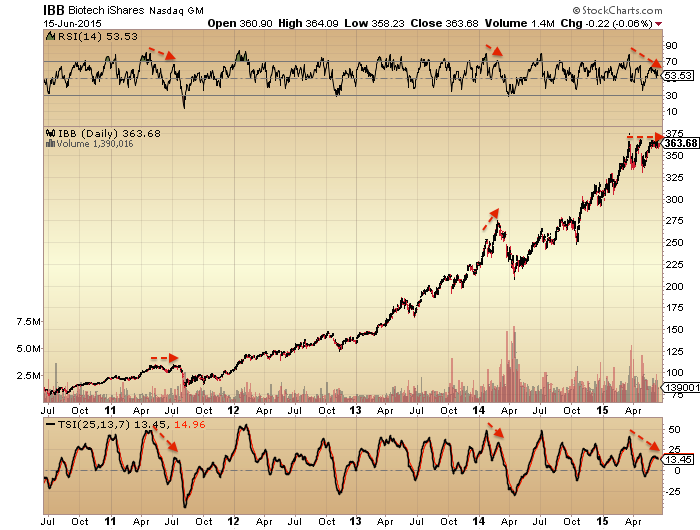 The breadth in the Nasdaq measured two ways peaked out around the solar max of April 2014. There has been some improvement since but still divergent overall. 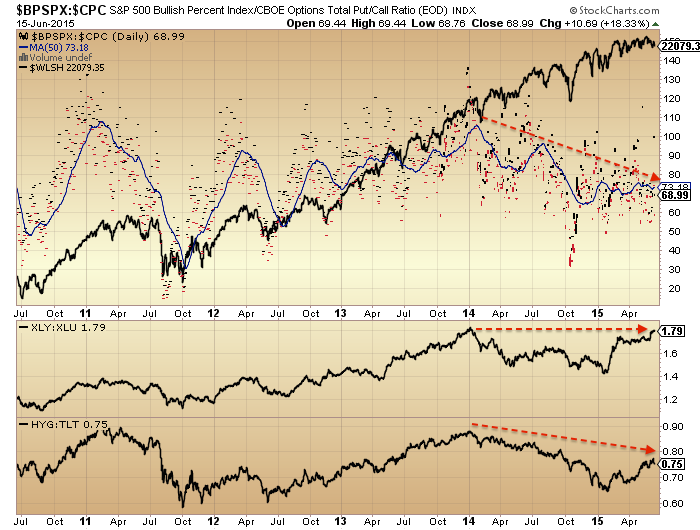 Bullish percent / put call ratio shows one of the longest divergences, together with high yield to treasuries. 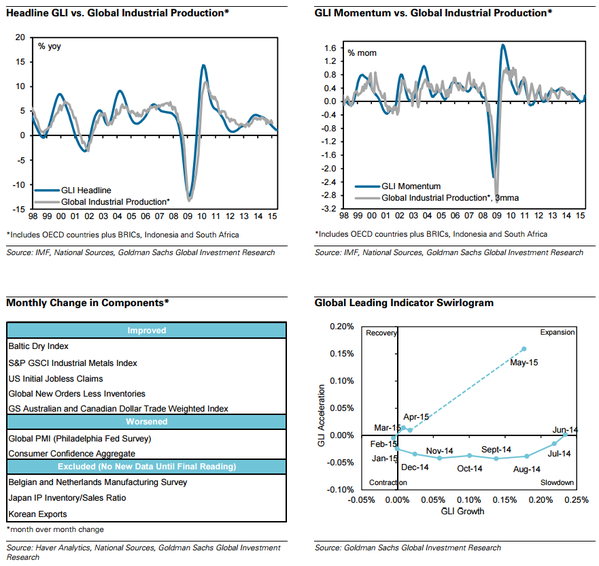 Cyclicals vs defensives has repaired itself in 2015 but is overall flat for 18 months. 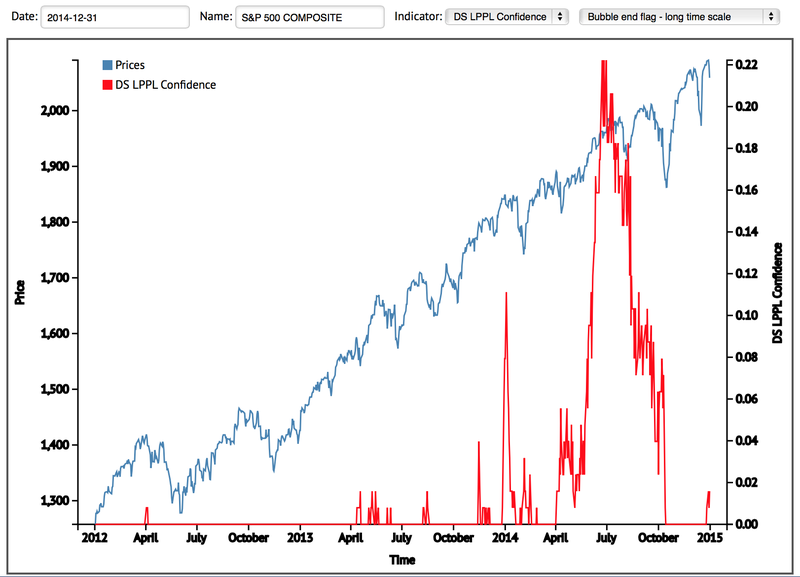 NAAIM manager exposure shows a divergence similar to the run into the 2007 and 2011 peaks. It made ‘an attempt’ into the mid-2014 peak too, but as we know, the market managed to recover. 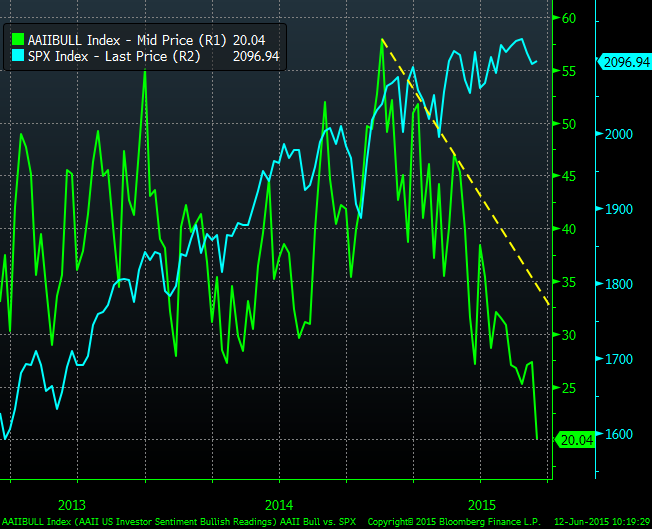 AAII bulls have also been making a divergence. 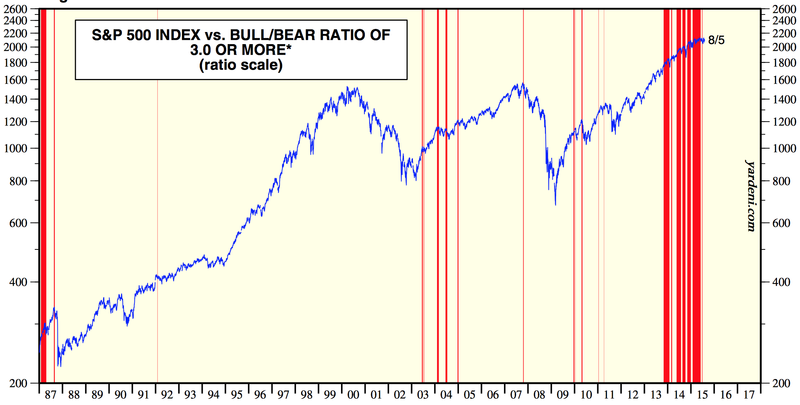 Oddly though they have now reached the same level as March 2009, so that could be contrarian bullish. I’d just repeat that AAII sentiment survey has a poor predictive history hence I rarely post it. 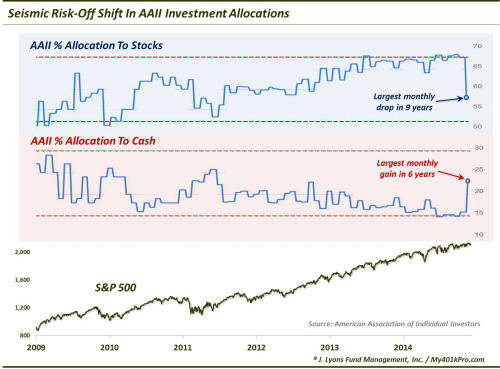 AAII allocations – different to the above source – shows a bizarre rush to exit stocks. Don’t know what to make of that. 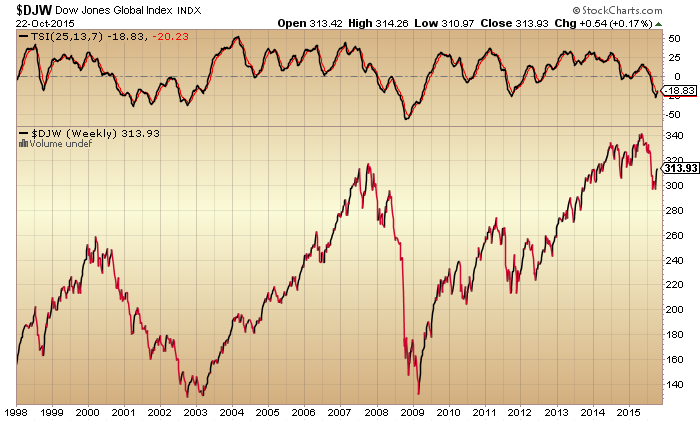 The Russell 2000 is one of the most bullish indices. 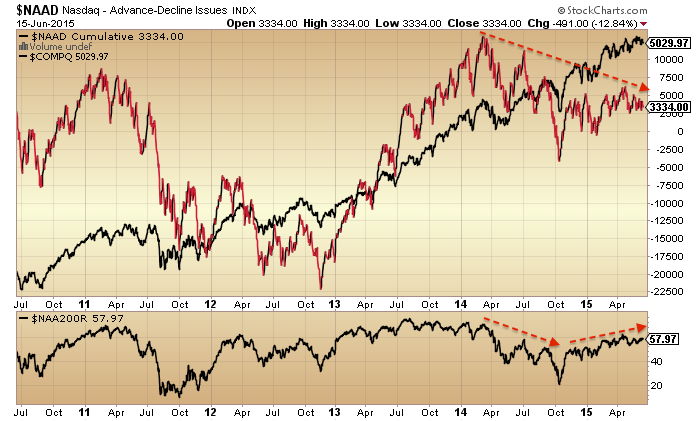 But the same divergence is showing as the SP500 above. 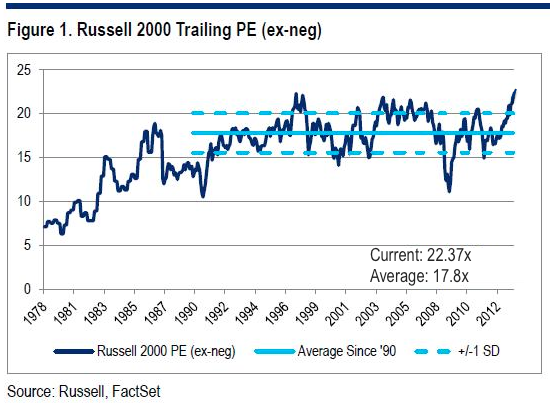 In terms of its valuation, the latest p/e ex negative earnings is 22.38, which you can see versus history below. If we home in the Biotech sector, arguably the mania leader, we again see the same divergences as both above and prior peaks. In short, there are a whole host of negative divergences in strength, breadth, volatility, risk-off, sentiment and allocations for US and world stocks. The original set kicked off at the turn of 2013 into 2014, and have since been added to, with a concentration around the 27 June 2014 triple confluence peak. I suggest there are only two ways to read it. 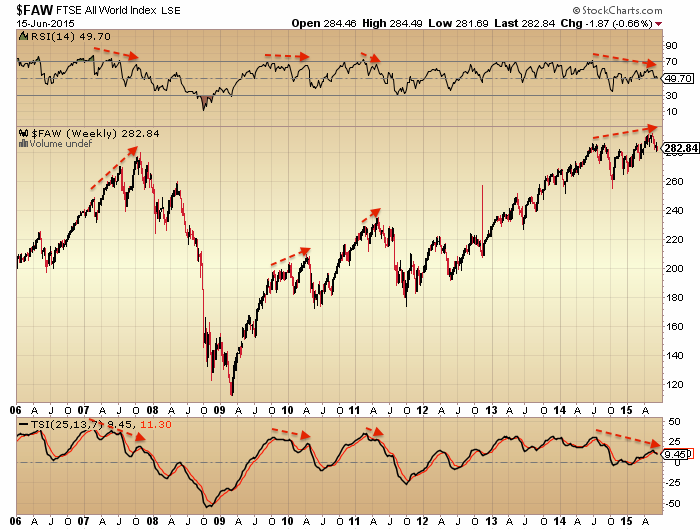 Either all the supports for equities have been removed and they are about to tumble to ‘satisfy’ all those divergences. Or, stocks have held up despite all those divergences and so we now see breadth, strength, risk-on, etc, start to improve again, launching stocks higher. 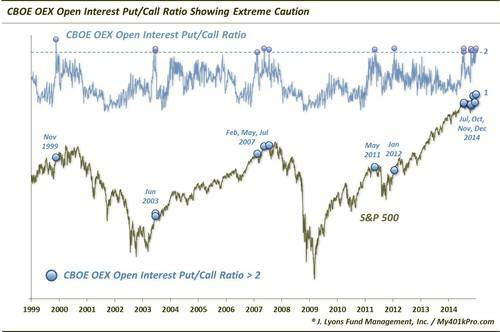 Needless to say, I side with the first option when we start to draw in valuations, allocations, leverage and other angles indicative of a major peak. Today is the new moon at the seasonal geomagnetic mid-year peak. Either from this point or from the new moon of mid-July, stocks have the best chances of falling, with downward pressure into October. 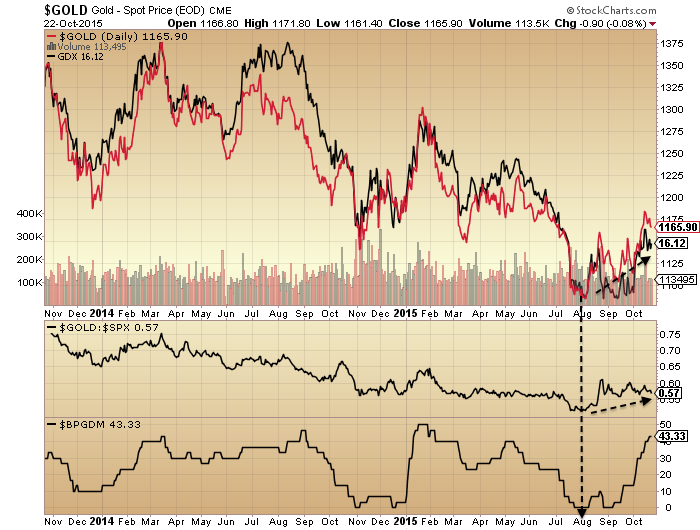 In short, I’m on the attack, looking to build onto my short stocks positions (and long gold). I’m looking for an entry into the Russell 2000 as I believe it has the furthest to fall once equities break. I want to leave some allowance for a potential rally back up into the mid-July twin confluence peak, but until the evidence changes, the real peak was a year ago, putting equities on severely borrowed time and making yet another rally back up here doubtful. 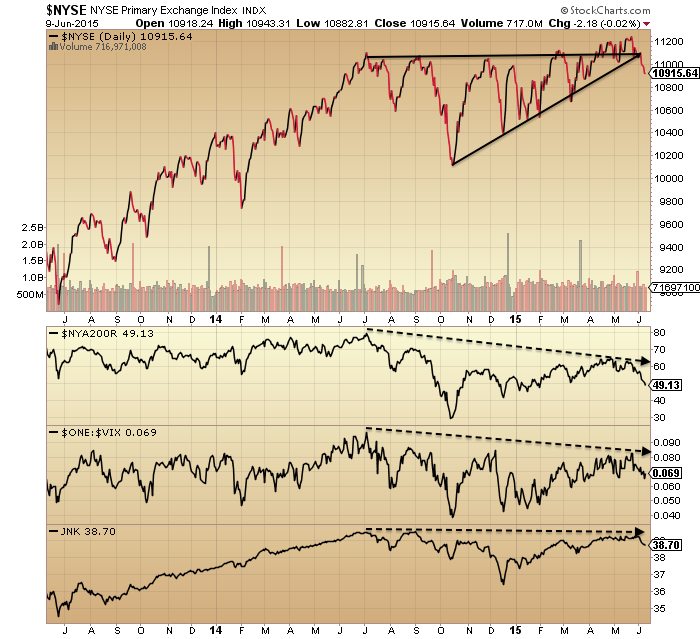 The Dow, SP500 and NYSE all attempted a break out upwards from the 2015 range in May, which failed and now looks like a fakeout. The last chart here shows the NYSE in a rather textbook bearish formation: wedge, fakeout, breakdown, retest of wedge underside, repelled. That whole move has been building out since last July and now looks ripe for completion to the downside. I see this as another reason to be attacking here rather than waiting. 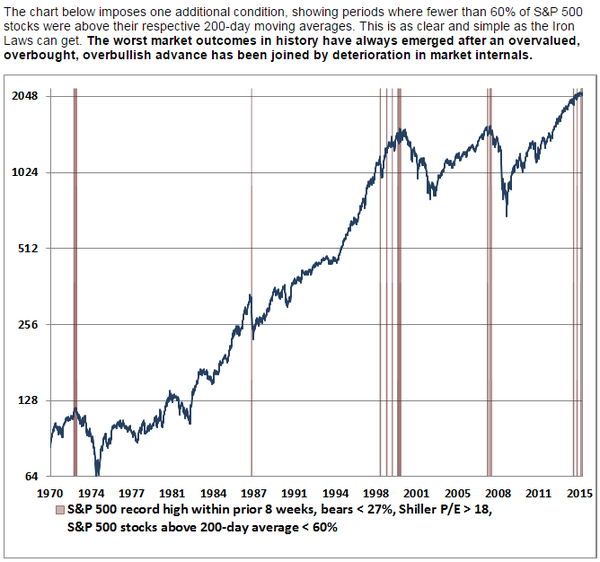 The last six months has been particularly weak economically, and normally historically stocks would have sold off leading into this, with stocks typically leading the economy. 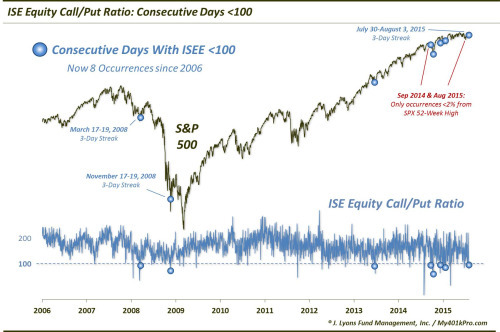 In fact, under such extreme levels of valuation, allocations, leverage and sentiment, together with growth, ‘flation, and earnings all rolling over negative as well as the speculation peak of the solar maximum through, the case was extremely strong for 2014’s October sell-off to launch a fully-blown bear market. The weakening economy over the subsequent 6 months and the wealth-reduction effect of the declining stock market would then have fed off each other to create fairly significant devastation. But it didn’t happen. Stocks were somehow saved. However, as pre previous posts, we see a lot of degradation in internals and cross-referenced data since mid last year, giving the potential for price action since then to be ‘last-gasps’. Below is the Dow Jones World stock index which reveals a similar higher high against weakening strength to the last 3 previous major tops. 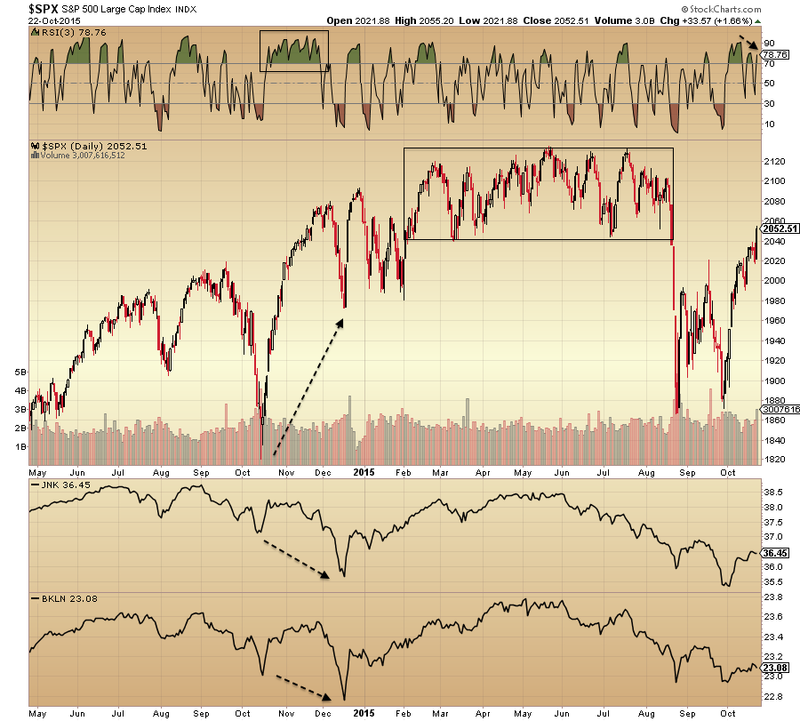 Plus, we have seen a sell-off in recent weeks, making that higher high maybe a fake-out high. We still see saturation levels in valuations, allocations, sentiment and leverage and many negative divergences that all support the bear case. However, set against this, we have recently seen a turn up in leading indicators and what maybe a bottoming in coincident data. At the same time we have seen some money exiting bonds and inflation expectations recovering, suggesting some of the expected pick-up being priced in by market participants. 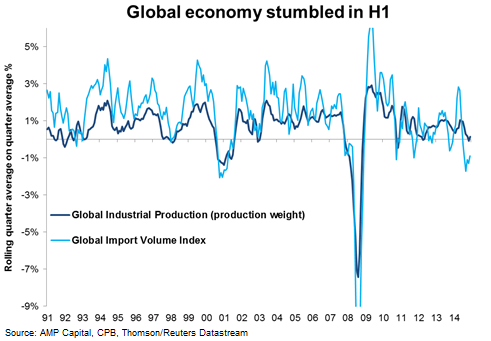 However, real money leading indicators predict this to be another non-sustained pick up in global growth, i.e. still not the move to sustainable strong growth that leads to central banks starting to raise rates. Rather, they predict the growth to peak by October this year and then give way to weakness again. 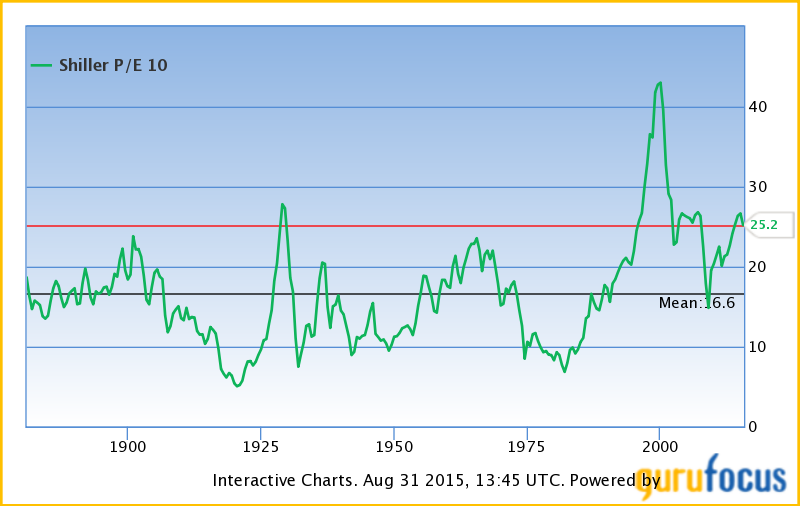 If stocks can do that, then an obvious reference point would then be 1929, with a potential Autumn/Fall peak, a similar length of time post-solar maximum, at similar extremes of valuation and leverage. Anything beyond that and there would be no further reference points. 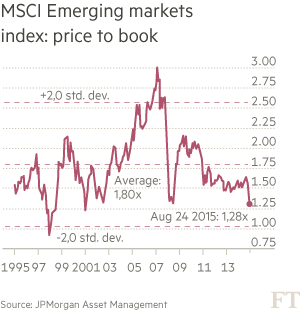 This really would be unchartered territory for world markets, whereby the ‘old rules’ no longer apply. Here’s a look at China’s stock market. The divergence from GDP is extreme and as such valuations are now at a new record. The rise in margin debt in China has rocketed. 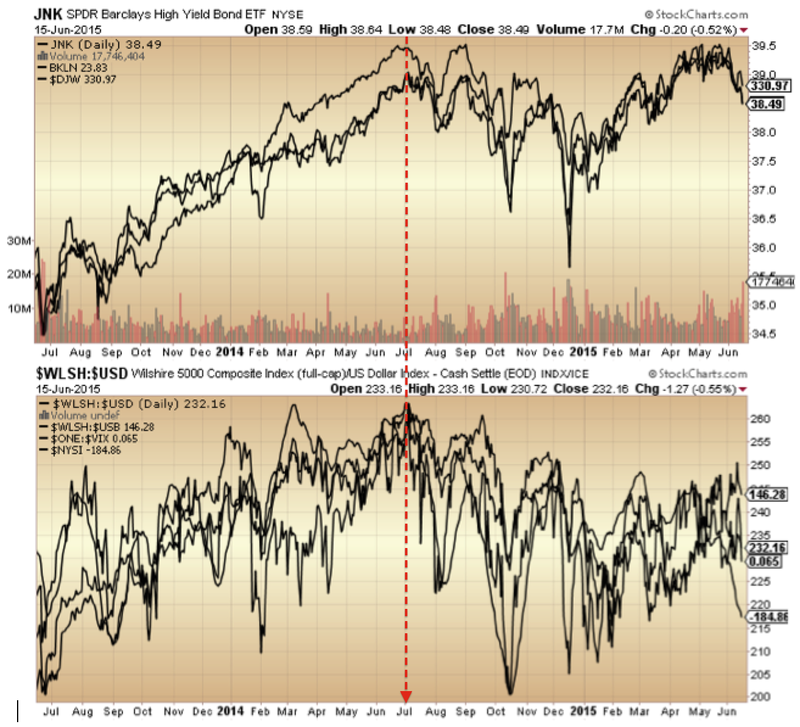 Leveraged-based stock rallies are ponzi-schemes, making for a risk of a major unwind at any point. The leverage situation around the world is similarly flagging that risk. In summary, I believe this is where we find out what really moves the markets. My position on that: dumb forces. 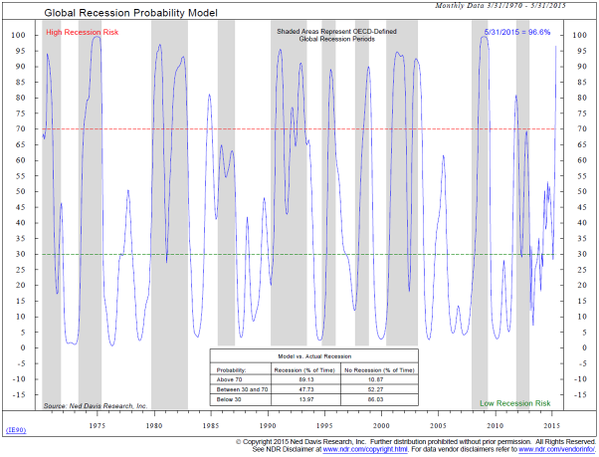 Demographics, solar cycles and simply running out of buyers. By the latter I refer to saturation in valuation, leverage, sentiment and allocations: everyone on one side of the boat and borrowed up to the max. 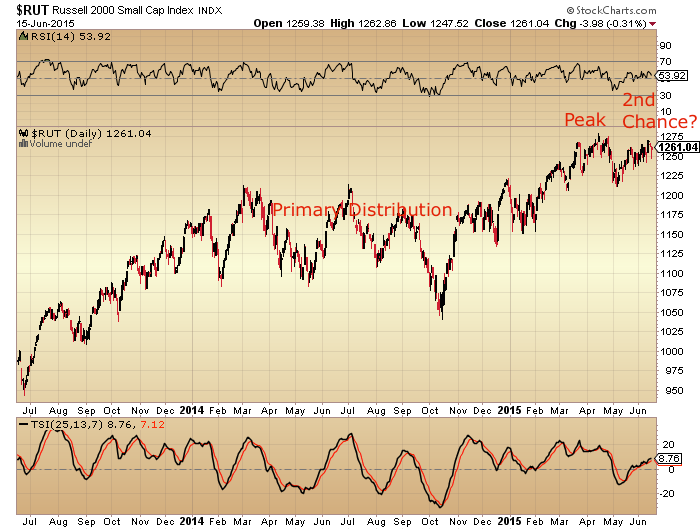 We can see additional clues to the fuel drying up in divergences in breadth and other indicators. June/July is the seasonal geomagnetic peak, so I don’t rule out the possibility of a short rally back up here in stocks. But unless all those under-the-hood July 2014 peaks are repaired, together with the bearish technical set-ups and negative divergences, then I expect leading indicators to be disregarded here, in the same way negative leading indicators were disregarded several months back. The fact that the market has risen against both positive and negative leading and coincident economic data the past 2 years is a clue that economic indicators aren’t the driver. So is central banks? I refer you back to the top two charts. 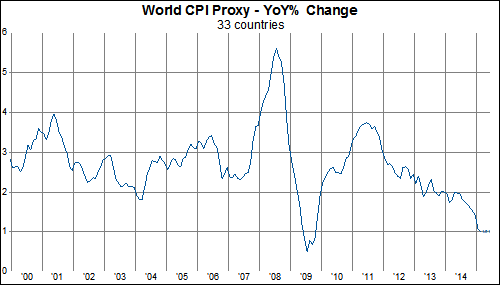 After billions spent on QE and ultra suppressed rates, we still have a world economy on its knees. That 4th chart now stands at 52 days and 15%, so ripe for conclusion. Skew is still in the elevated range warning of potential large move. 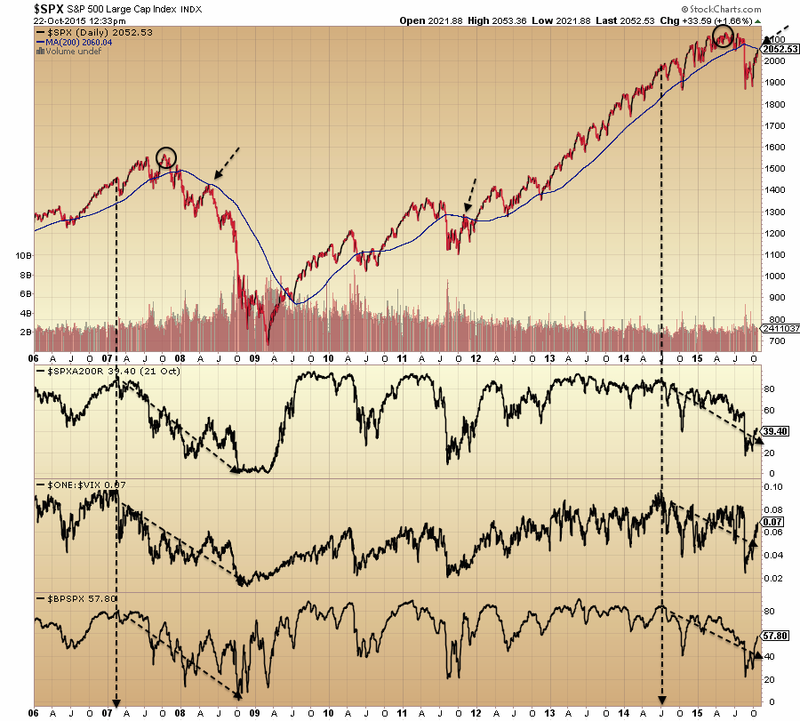 SP500 bubble end still showing as start of July. 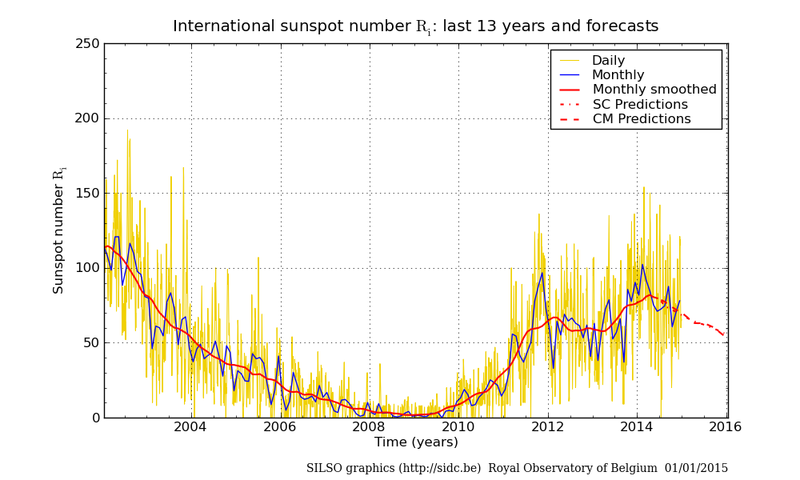 Both sources, plus IPS additionally, show the smoothed solar maximum behind us in April 2014 with a value of around 82. 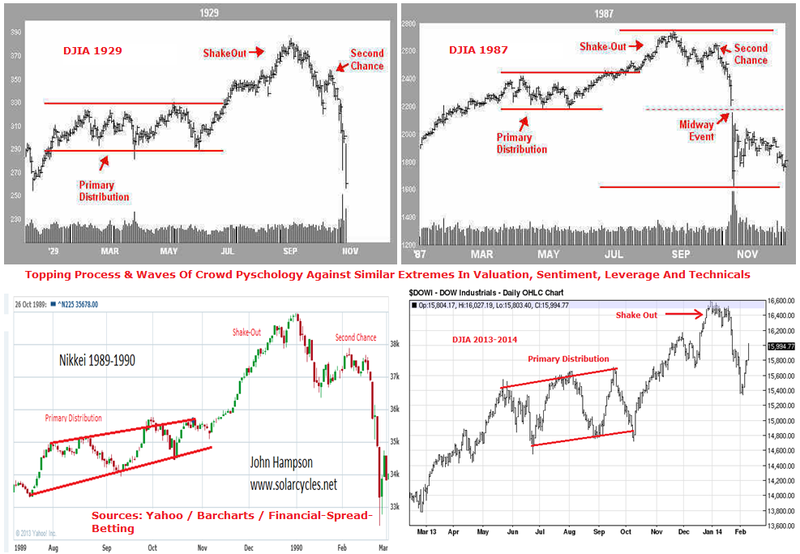 Summing up, the picture painted by these indicators is consistent with my last post, namely that stocks have been in a topping process in 2014, that the solar max and speculation peak is behind us, that the effective peak in stocks was end June / start July 2014 and that stocks are still set for a big move to the downside. 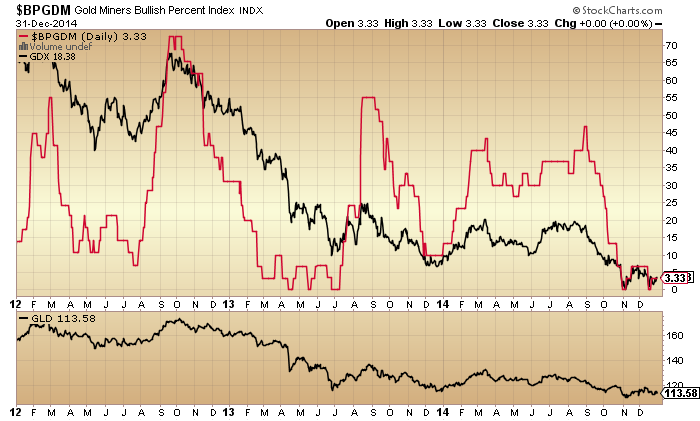 Plus, fortunes in the US dollar and gold/miners should reverse, fitting with the reversal in stocks. 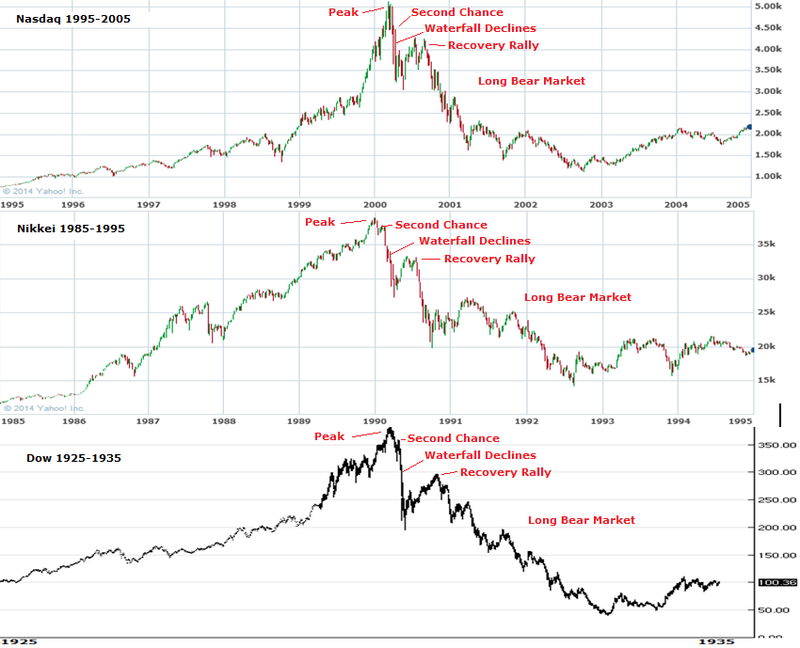 Recall the 1989 solar/stocks peak. 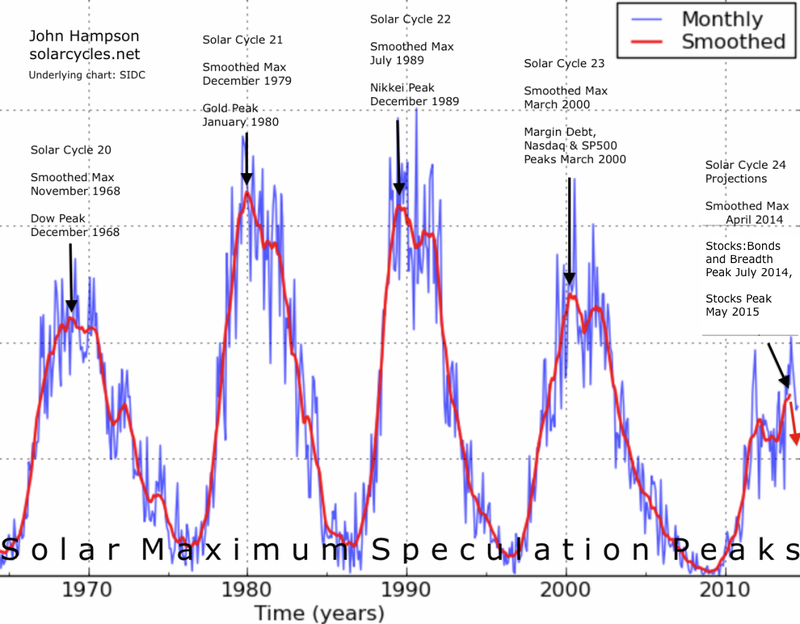 The solar max was July 1989 and stocks (Nikkei) stretched upwards until the end of December 1989 before finally topping out and falling. However, note the new moon then was 28 Dec, providing an additional optimism peak. Here at the turn of 2014/2015 the new moons are 22 Dec 2014 and 20 Jan 2015.